NORTH CAROLINA. (THECOUNT) — The dire effects of Hurricane Florence are no joking matter, having said that, the Weather Channel is standing firm, backing reporter Mike Seidel, who was depicted in a live hit seeming ready to blow away compliments of “hurricane” force winds. That’s when a couple of dudes walked by effortlessly in the background. 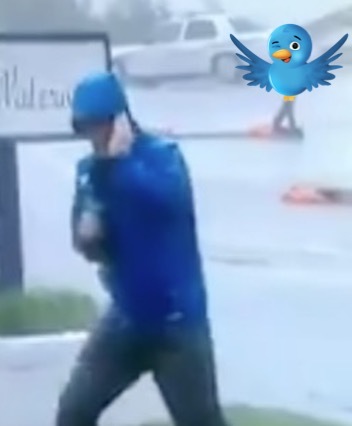 While Seidel is getting lambasted on social media over his antics, the Weather Channel has officially responded, saying that folks on the internets should consider a few very important facts – the man was sleep deprived and already standing on shaky ground – or at the very least, wet grass. … “It’s important to note that the 2 individuals in the background are walking on concrete, and Mike Seidel is trying to maintain his footing on wet grass, after reporting on-air until 1:00 AM ET this morning and is undoubtedly exhausted,” said TWC in a statement posted to social media. Check out the video again below! His pants are about to blow off! Okay now That would have made a great viral video! On second thought, maybe not. This is a lighthearted post about Seidel, (and his blowing pants,) but more importantly, our hearts go out to the folks who lost their lives and those suffering as a result of Florence. Click here or the picture below to watch the hilarious video.